I love this. I recently started using RescueTime for the same reasons. It's even more motivating than I thought it would be! (I don't use the $$ version which can include things like "talked to so and so" but just tracking what I do on my computer is a huge huge help to my productivity.) thanks for this! I use Evernote as well...wheels are turning! I've heard good things about RescueTime! Thanks for bringing it up. It seems like a really interesting way to passively get data on what we spend our time on. Any tips for people getting started with it? What has surprised you? I set up a recurring notification in my Outlook calendar called "what did you do today?" and set it to go off ~45 minutes before I usually leave. It's really just a link to a OneNote notebook where I have tabs for each month and add individual days to these tabbed areas. I usually put in hours worked, summaries of what I did that day, and my reference hours. It's simple, easy, and "automated" enough that I do it consistently, plus (like you mentioned!) it's a great way for daily work reflection and helpful for tracking accomplishments, professional development, and projects. Love it! One huge disfluency in my overall notetaking has been working between Mac and Windows systems. My library uses MS Exchange for email, and I do a lot for work in Outlook 2013 that I can't in any Mac product. Switching to an all-Microsoft environment for work has been...tempting. Now that MS has released OneNote for Mac, I might have to play with that particular fire again. It's good to hear that OneNote with Outlook has been working out so well for you! Great post, I really need to do this! I have difficulty sometimes remembering what I've done from week to week, and I'll check my Outlook calendar to jog my memory. A daily log like this will be so helpful in tracking progress and knowing what I'm spending my time on. Right now I use Workflowy more than Evernote, but I might play with both to find what works better for me. I haven't tried Workflowy; I'll have to check it out! 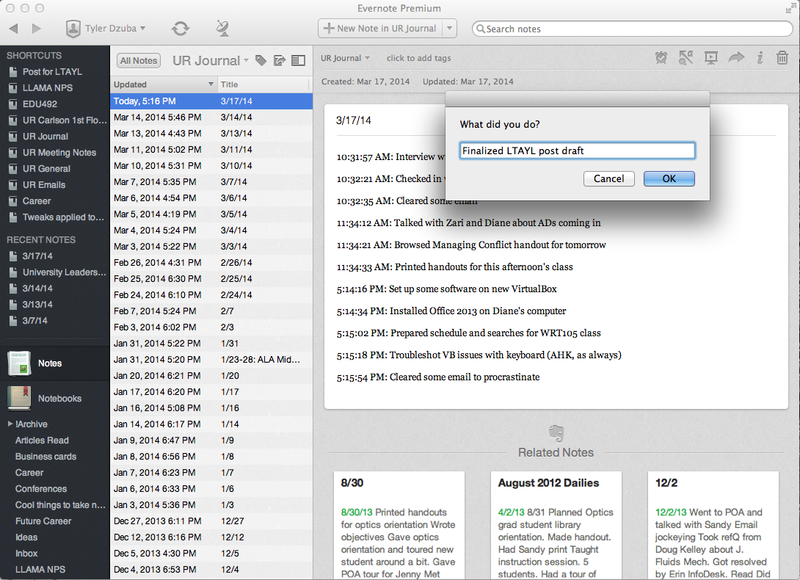 First glance, it seems pretty nifty, and definitely a lot more streamlined than Evernote. Good luck! What a good idea! I will play around with this in Evernote tomorrow. As a matter of fact, I've already set up a notebook called 1WHAT I DID TODAY (I added the 1 so that this will file at the top of my list). I'm all ready to go. Thanks for the tip. Yay! I'm glad you're trying it out! I do something similar with exclamation marks: ! alphabetizes above all letters and numbers in basically everywhere I've tried it. I'm a big fan of having folders labeled "!Archive" in places where I need to keep things but don't need to see them regularly. Actually, you can see my !Archive notebook stack in the screenshot in this post! That stack (i.e. superfolder for notebooks) holds a ton of notebooks from my job search, my MSLS program, and past committees. No matter what method(s) work best to keep track of accomplishments, the important thing is to keep track, period. For years, whether a supervisor has required it or not, I have been writing quarterly activity reports. Just a bulleted list of job activities grouped by function, plus service and research/creative work. I write much of it from memory, as well as refer back to the previous report and (yes) scroll through the last three months of sent email. You're right about that; most non-routine activities have at least one associated email. It takes a few hours, but it pays off at review time. When I come up at the end of 2015, those 12 quarterly reports will be everything I need to write my self-review, without worrying about missing any significant accomplishments. Last fall I started using Todo on my iPhone/iPad. I have quarterly goals, but I needed a task management tool to identify, check off, and sometimes reschedule activities on a daily basis. And as an experiment I have also started a daily log. I'm a big Evernote user, and their built-in timestamp (ctrl + ;) takes care of the automation. Even with just a few days, it's been interesting to see how the unexpected things impact the planned ones. Ok, I'll bite on some of the gory details. How are you getting Evernote to give you question prompts like that? Is that an Evernote thing, a Quicksilver thing, or some scripting magic between them? I'm glad you asked! Some scripting magic is the short answer. Modify as needed for you. In summary, the script throws up a dialog box (the one you see in the picture), and either (when I run the script the first time in a day) makes a new note in the right notebook entitled with today's date and containing whatever I typed into the box with a time stamp, or (later in the day) appends what I typed to end of the existing note. Quicksilver (http://qsapp.com) can do many things for a Mac user—that's another post—among which is assigning global shortcut keys (QS calls them Triggers) to do things like, say, running an Applescript. So from anywhere on my computer, I can press that key combination and run the script. Why would you do this? Because practically no software uses all four modifier keys in its shortcuts, which means that you now have what amounts to a whole new shortcut key that conflicts with nothing else. So, bottom line: I used CapsLock+J (= Ctrl+Shift+Opt+Cmd+J) as my trigger key to have Quicksilver run the Applescript, which gives me a handy dialog box from anywhere to type what I just did, then puts it safely in the right place in Evernote. Thanks! I prefer Launchbar to Quicksilver, but I was able to get it working just fine with it too. I trigger it by hitting CMD-Space and typing "WD" (I'm better at remembering 2-3 letter mnemonics than keyboard shortcuts), and everything else works just the same. This is a great idea -- with performance reviews coming up soon, I find myself wishing I already had a system like this in place! I'm definitely going to try this out for next year. I've been using a system which isn't nearly as detailed (or technically advanced) but helps capture at least the major things that I do. I have a big wall calendar in my office, and whenever I make an appointment or have a major event coming up, it goes on a fluorescent sticky on the calendar -- blue for research consultations, pink for classes, yellow for outreach events, etc. I layer on as many as I need. Then at the end of the month, I snap a picture of the calendar and save it to my iPad. It's a good way to keep at least a visual overview of the ebb and flow of each month and the major tasks I am accountable for.